So far, Penzance has escaped the headaches caused up country by the current craze for organisation of labour. But events this afternoon – a Saturday, indeed, when all should be peace, calm and the girding up of spiritual loins in advance of the Sabbath – rather indicate otherwise. Taylor’s – that’s Taylor’s Coal Depot Ltd of course, not the garage in the Greenmarket - are nothing if not an “enterprising firm”. They have been “mixed up with machinery and mechanical propulsion of one kind and another all their lives”. Take, for example, their latest excursion into modern haulage and traction - the steam lorry. An end to horses and all the mess, danger and attendance they require on a busy quayside. Doubtless a few grumbles from stablehands and purveyors of harness, but no complaints from the men down at the docks. Four men to a gang when a collier comes into the dock, 2d a ton; two in the hold, two on the winch – that’s the way it’s always been done. Then a boy to hitch and unhitch the load, and labourers to take the stuff in baskets to be carted away. 32 men in all, to unload a cargo. When the steam winch came in, that was one job gone, but – it has become apparent - that was only the start. The new crane will move coal by the half ton. Those 32 men? Well, they say one in four will keep their jobs. Steam will replace the rest. So Taylors’ latest venture has provoked a bit more of a breeze. 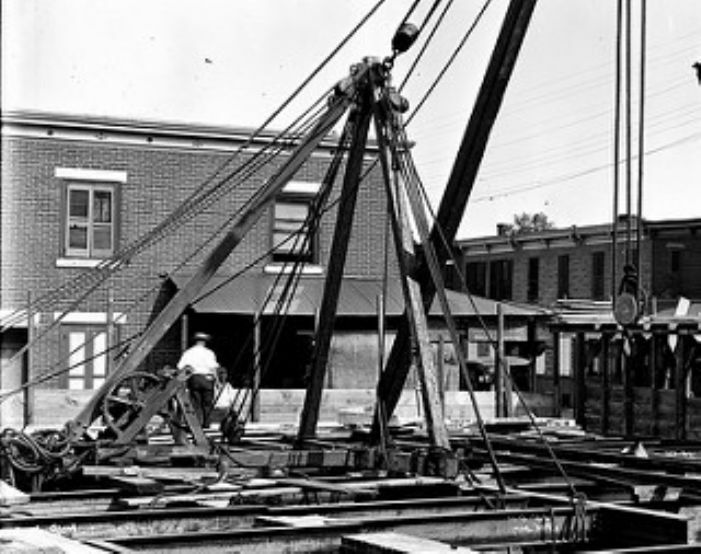 The Town Council, in its wisdom, has given the firm leave to install a steam crane on the dock wharf. Now that, of course, is an entirely different matter from a winch or a lorry. The men at the dock could at once see the threat to their livelihoods. We can all see for ourselves, every day - at the railway station, over in the mines - the power of steam to shift huge loads; a modest engine doing the work of ten, perhaps twenty men. And so, taking a leaf out of the book of labourers elsewhere, the labourers went against their nature as independent Cornishmen. And now, the scourge of organisation has hit Penzance. Some self-appointed leader took it upon himself to draw up a memorandum “pledging the men not to work under the new conditions”. Not all would agree to do so. Some, confident that their jobs will be the ones saved, and even perhaps at a better rate of pay than previously, welcome the crane. They look to Hayle, where the new system is already in place. There is as yet, thankfully, no trade union, and the strength of the organising faction lies purely in “moral suasion”. Messrs Taylors, apparently unperturbed, have continued to install the mechanism as agreed. By this afternoon, when the Voltaire arrived in the floating dock, the crane was “practically in working order”, next to the old one, owned by the council. And word went round that both cranes would work together to unload her cargo of coal. After “a somewhat excited gathering on the quay” the steamer shifted over to Albert Pier, where there are no cranes at all, and the men went off to fetch their shovels. You would think that the everyone would be happy at that, with coal being moved in the time-honoured manner. But the men who had signed the memorandum seemed to have paid heed to the words and deeds of their brethren in the cities. One or two agitators said that they would not work with those who had refused to sign, and of course the others followed suit and downed tools. 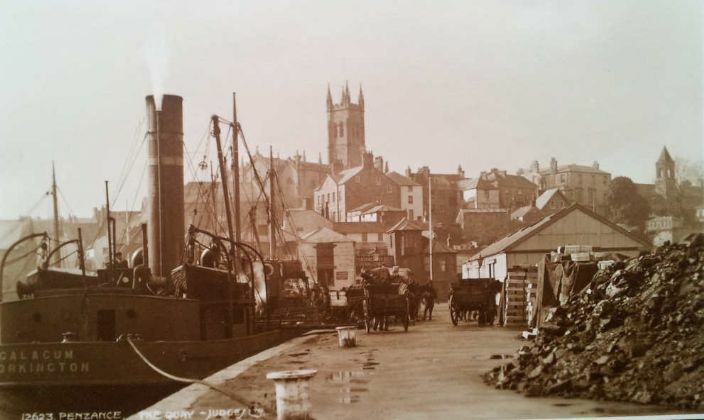 What does the future hold for Penzance dock? A century from now, shall we see dozens of men with baskets, lifting and shifting cargo by the basketload? Or a line of steam cranes, each worked by eight well-paid men, the cream of the workforce? Time will tell. But – however many heated speeches agitators make - “history has shown that in the battle between machinery and manual labour it is the machinery that has almost invariably won”. Fine turn of phrase that. I rather like it. It shall have its place as a fitting conclusion to my report for the Cornishman. Machines replacing men? That is something, at least, about which we brain workers need not be concerned.